One of the things I really like about my neighborhood, aside from the fact that it's close to all the cool stuff, is that I'm right on Turtle Creek. Turtle Creek, as the name implies, is a creek with turtles in it. According to Wikipedia, it's a tributary of the Trinity River. When I moved back to Dallas from Switzerland 3 years ago, I discovered a small park across the street from me right on the banks of the creek. At the time it was home to a white swan, a mated pair of Australian black swans, three grey geese and hundreds upon hundreds of ducks. Since then, the white swan has disappeared, the two remaining geese have moved downstream, and one of the black swans has gone missing. In addition, the duck population has been decimated. We suspect coyotes are to blame. 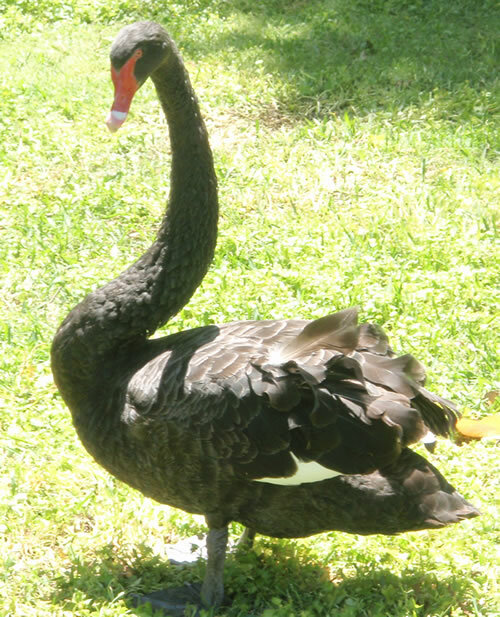 The lone black swan is a popular neighborhood resident and much loved. Everyone keeps an eye on him and he seems to appreciate the attention now that he is without his mate. It recently dawned on me that it had been a while since I've seen the swan. He hides sometimes, and I didn't think anything of it at first. But when several days passed and there was still no sign of him, I began to fear the worst. A few days ago, I learned that he was attacked by raccoons, or possibly coyotes. He was rescued but injured, and is now convalescing in a wildlife center. Please join me in sending him your positive healing vibes! He is a beloved neighborhood pet and we are looking forward to having him back home.